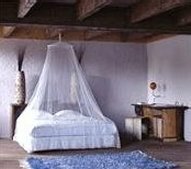 The bedroom is perhaps the most important place where you want to be free of EMF pollution because this is where you need to rest and recharge. Therefore you want to be exposed to as little EMF pollution as possible while you rest. Pregnant mothers must especially protect themselves during sleeping hours as you can see in the various video demonstrations of Dr. Dietrich Klinghardt found on Youtube. To protect the bedroom, you can paint the walls with special graphite based paint and then electrically ground this paint. You can also buy curtains made of shielding fabrics that you can use to make drapes or a bed canopy. You can also buy a Faraday cage for the bed, which is what I recommend. If you live near a cell phone tower you can employ more expensive measures such as special shielding and paint for your bedroom, but most people usually start with a Faraday canopy, made with silver, because it is easy to install and move from room to room. Being made of silver, it is an investment meant to lat a lifetime and give to your children later in life. The Kingsized bed option is the most popular. 1. Use only battery devices near your bed because many electrical devices, such as clocks, produce high magnetic fields whereas battery powered clocks pose less problems. 3. Eliminate all RF (radio frequency) sources from your bedroom, such as WIFI, and this also includes cell phones and portable phones, so don’t keep cell phones or charging stations in your bedroom. 5. Shield your sleeping conditions, and protect the time you sleep with a special Faraday Canopy shown (made in Europe of metallized fabric). This will protect you from harmful RF signals, such as strong sources of microwave or Wifi radiation, that can disrupt cellular communication. This may be particularly important for women who are pregnant and helps electro-sensitive people obtain a restful sleep.